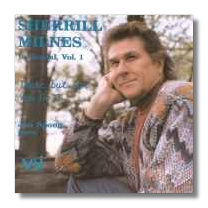 The American baritone Sherrill Milnes (b 1935) has sung at the Met and other leading opera companies around the world since the 1960s and is a prolific recording artist. His repertory includes all the important Verdi baritone roles, as well as a lot more, and he is generally admired for his brilliant top tones and for the robust energy he puts into his singing. This is apparently his first recital disc, though it is in fact put together from a number of live performances between 1980 and 1990 (more specific dates are not given), and it presents problems. The program is attractive and varied, presumably reflecting what he would sing on any given evening: three arias by Benedetto Marcello (1686-1739), Brahms' Four Serious Songs, a group of Duparc mélodies, two Copland songs, and finally, several ballads and show tunes. Milnes is essentially a theatrical artist, with a strong and penetrating voice that is projected with dramatic effectiveness but lacks the subtlety and variety of color needed for the intimacy of the recital hall. His diction has always been somewhat careless, even in Italian opera, and this is most apparent in the French songs (though few Americans can sing them well). Also, by 1980 his voice was showing signs of strain at the top of his range and a troublesome vibrato in quiet passages. As you would expect, he is at his best in the one operatic aria on the disc ("Nemico della patria" from Giordano's Andrea Chenier); elsewhere, his interpretations are intelligent but unbeautiful and not really very interesting. The sound is barely passable, tending to break up in loud passages and excessively reverberant on a number of tracks. Milnes is a fine singer in his own field, and this is not it.